1 large structures | This Blog Rules | Why go elsewhere? We’ve talked about world wonders before and new world wonders recently. And we seem to talk about science – fiction on a weekly basis. This is why we thought about it and started looking for traces and marks of hard science fiction that are present in our world. You think this is strange? Many years ago, people considered science – fiction the buildings that were competing around the world for the “Highest” Award or World Record. Some restaurants in the world compete for the “Crazy Strange” awards and a lot of man – made contraptions ten years ago you would have pinned as the sick creations of mad geniuses, today they don’t surprise anybody. So we figured, let’s see what the future holds in terms of touristic attractions, and by this we don’t mean the Mayan Trail, the Pyramids or some famous UNESCO heritage. We won’t even mention the “old” crazy and strange hotels in this world, as many people have spoken about them before, including us. Today we will see hard science fiction touristic attractions that need to be built. And when they do get built, they will shame every classic science – fiction writer that ever lived. 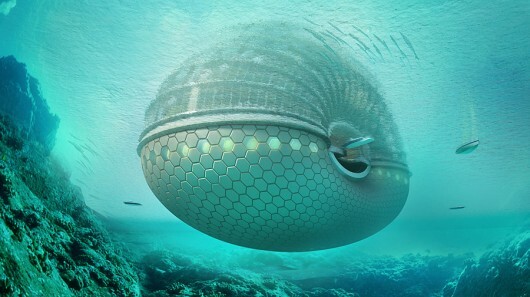 The deep-sea engineering company Deep Ocean Technology came up with such a futuristic project involving a science – fiction inspired hotel, that the first news related to this construction were, of course, also related to Dubai. 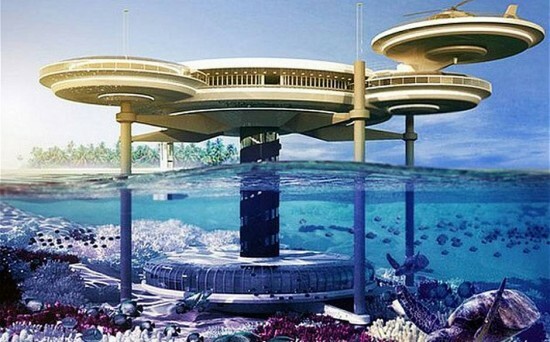 Where else could you find an investor to own an underwater hotel (well… half of it) built on pylons and inspired from the shape of the Star Trek USS Enterprise? But the highest bidder proved to be Ridgewood Hotels and Suites Pvt. Ltd and one of the most intriguing science – fiction touristic attractions is set to commence in the Kuredhivaru Island in the Maldives. The giant structure that looks like something Frank Herbert would have described will attract millions of guests, not only because it is set in one spectacular touristic area, but because it is one of a kind in everything you can think of in terms of “underwater fun”. If they make it, this world will stop for a second from its rotation only to admire what man can do with the proper technology. There are no recent news about this project, but those dating two – three years back were talking about a ship so large, it could be considered an island or a small state which could claim autonomy. It could host 10,000 passengers and it would provide so many services and attractions, you wouldn’t want to ever escape this island, much to Jules Verne’s vision of the Propeller Island. If Alstom Marine (the company announcing the project) manages to build this floating monster, there is no science – fiction movie or book to even compete with it. Megastructures? Tall buildings? 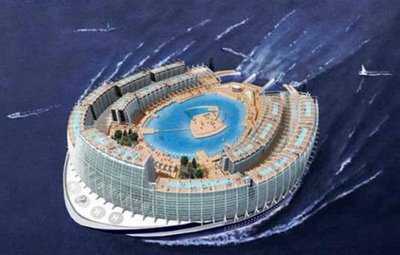 Man-made islands? The future is no longer in fiction, but here, on this planet, slowly but steadily growing. Among the most amazing science fiction touristic attractions that will shame the old world wonders, these three seem to be the most daring and plausible to become real.